The small SUV and crossover segment has seen booming sales lately and Hyundai is finally jumping full force into the market with its all-new 2018 Kona! The Kona is a sporty and somewhat funky looking vehicle perfect for those with an active lifestyle. While the smaller size and black wheel arch guards makes it better for tight city maneuvering, there is still 18 cubic feet of cargo volume behind the rear seats. The rear seats will also fold flat 60/40 style for even more carrying space. 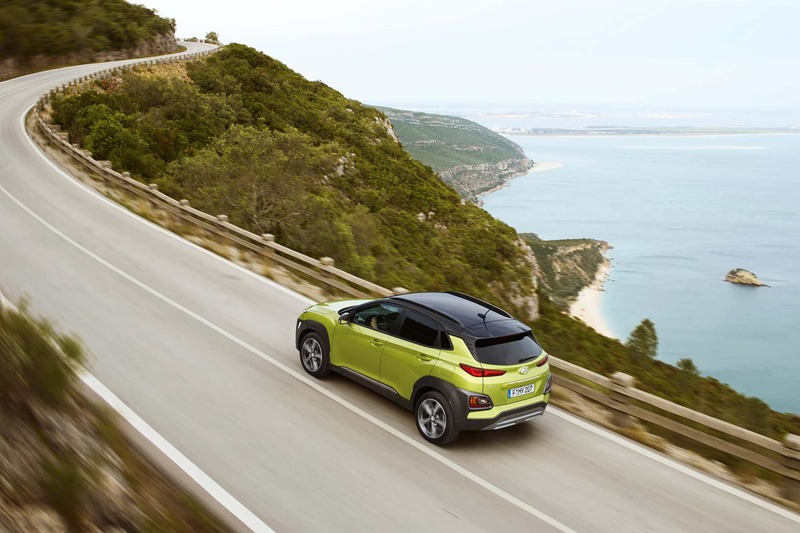 The standard U.S. Kona will come with a 2.0-Liter engine making 147 horsepower and 132 lb-ft of torque. The optional powertrain increase is a Turbocharged 1.6-Liter producing 175 horses and 195-lb-ft of torque. Fuel economy estimates have not yet been made for these engines. After the initial announcement of the Kona, a third powertrain option has been confirmed for the 2019 model year: a fully-electric EV model boasting an impressive driving range of more than 240 miles. That range, if reports are accurate, would rival even the $80,000+ Tesla Electric Vehicles. Whatever option you choose, All-Wheel drive will be an option, making it safer to drive during dangerous weather and a perfect vehicle for any off-road adventures. The fun color and styling doesn’t stop on the outside of the Kona; red, blue, and green body-colored accents on the shifter, vents, and leather stitching add spice to the otherwise simple control layout. While the cabin layout is ergonomically easy to use, there is no shortage of available tech. A 5.0-inch Touchscreen Display comes standard, with a 7.0 and 8.0-inch with GPS navigation as optional step-ups. 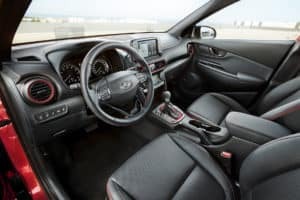 Other available tech features include Android Auto and Apple CarPlay compatibility, a wireless charging pad for devices, and 4G Wi-Fi connectivity. Another feature is an available heads-up display (HUD) that will display speed, gps-navigation directions, safety warnings, audio info and more right on top of the traditional gauge cluster behind the steering wheel. Similar HUDs have been features in the past on certain Mazda vehicles, and the idea seems to be taking off as another great idea to keep drivers less distracted and safer on the road. 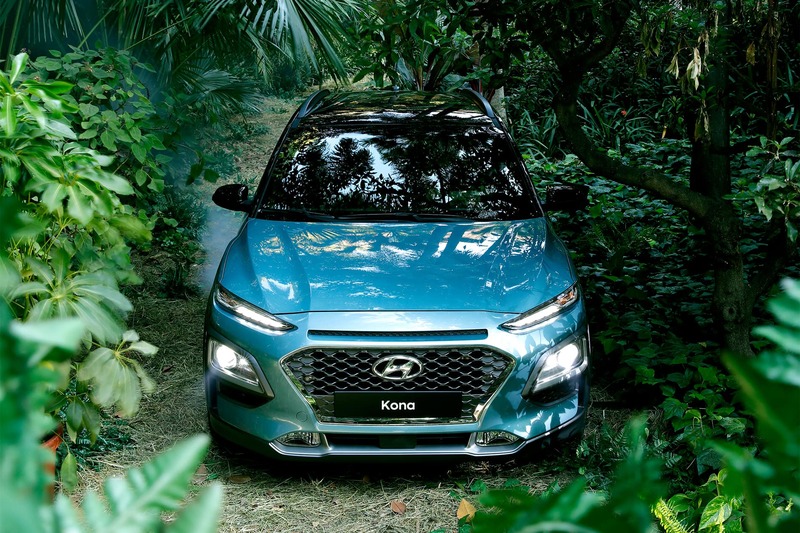 The Kona also comes with a full suite of active-safety tech: blind-spot monitoring, rear cross-traffic alert, lane-departure warning and lane-keeping assist, automatic high-beams, a driver-attention monitor, and forward-collision warning with automated emergency braking. U.S. sales of the Kona will begin in early 2018. 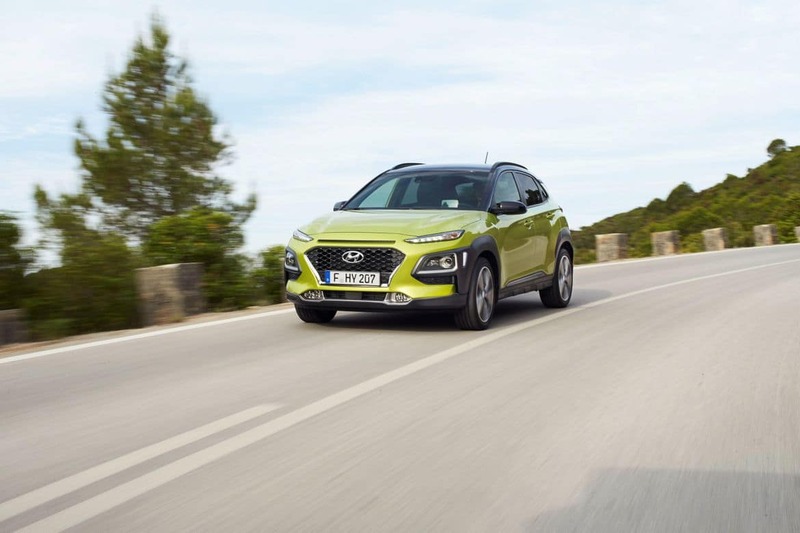 Prices have not been officially released, but we know the Kona will come in four trim levels: SE, SEL, Limited, and Unlimited. 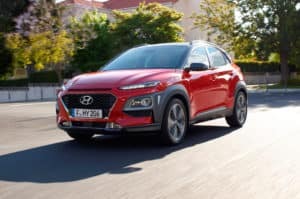 We expect prices will offer buyers a better value than other small SUV competitors, putting the Kona somewhere in the under $20,000 range. Follow us on Facebook and check out our website hyundaioflousiville.com to keep up with all the news on the new 2018 Hyundai Kona including when the first models arrive! Give us a call at (888)216-2365 if you want to be the first to get your hands on this awesome new SUV! Check out photos of the Kona below! 0 comment(s) so far on The 2018 Hyundai Kona!